Be the first to share your favorite memory, photo or story of Dorinda. This memorial page is dedicated for family, friends and future generations to celebrate the life of their loved one. 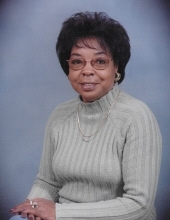 Deaconess Dorinda Bridgeforth, daughter of the late Floyd and Lacy Fitzgerald was born on June 6, 1945, in Nottoway County, Virginia. She entered eternal rest at Bon Secours Memorial Regional Medical Center in Mechanicsville, Virginia on October 12, 2018 at the age of 73. At an early age Dorinda accepted Jesus Christ as her Lord and Savior and was baptized at Mt. Gazerine. Throughout her life, she dutifully and gladly answered the call to Christian service in her church and community. Dorinda knew the value of education and she was determined to share her vision, knowledge, skills and blessings with younger generations. After graduating from Luther H. Foster High School in 1963, she entered Saint Paul’s College and graduated in 1971 with a Bachelor of Science degree in Elementary Education. She continued on to obtain a Masters degree from Virginia State University in Elementary Education in 1977. She worked for the Lunenburg and Nottoway County School Systems for over 30 years as an elementary school teacher before retiring. The love of her life was Allen Stewart Bridgeforth, Sr., they were schoolmates at A. G. Richardson Elementary School in Blackstone, Luther H. Foster High School in Nottoway and Virginia State University in Petersburg. Perhaps their daily journey on school bus #21 was the spark that ignited their love. Stewart and Dorinda married in October 1965. Their marriage became even more joyful when blessed with the birth of their beloved son, Allen Stewart Bridgeforth, Jr. Stewart and Dorinda remained in marital bliss for 50 years until God called Allen to his heavenly reward. To celebrate her life and cherish her memory, Dorinda leaves her beloved son, Allen Jr. of Crewe, Virginia; one brother, Ralph Fitzgerald of Blackstone, Virginia; two sisters, Barbara (Walter) Garris of Colorado Springs, Colorado, Jacqueline (Jerome) Robinson of Richmond, Virginia; two godchildren, Ashely McCoy and Jared Robinson; two brothers-in-law, James Patterson of Newport News, Virginia and James (Barbara) Bridgeforth of Crewe, Virginia; three sisters-in-law, Marie (Bernard) Fitzgerald of Blackstone, Virginia, Harriett (Simon) Greenhill of Crewe, Virginia and Jeanne Bridgeforth of Bronx, New York; and a host of cousins and friends. Funeral Services Saturday, October 20, 2018 at 11:00 am at Mt. Gazerine Baptist Church, Blackstone. Interment Springhill Baptist Church Cemetery, Blackstone. To plant a tree in memory of Dorinda L. Bridgeforth, please visit our Tribute Store. "Email Address" would like to share the life celebration of Dorinda L. Bridgeforth. Click on the "link" to go to share a favorite memory or leave a condolence message for the family.